Under one roof: The Collective has an in-house salon, café and music and book store. As far as concepts go, The Collective is fairly straightforward. A multi-branded, multi-storeyed men’s store that emphasizes service, throws in salon and concierge services for good measure, and caters above all to the sartorial tastes of this sometimes ignored retail demographic. As a concept in India, however, The Collective is revolutionary. The store that opened in Bangalore earlier this month is arguably the first (and only) luxury department store targeted at men, with an offering spanning from jeans to bespoke services to watches and home decor. “No, is never the answer at The Collective", says George Santacroce, CEO of Madura Garments Lifestyle Retail Co. Ltd, a division of the Aditya Birla Group. Indeed, a concierge desk at the entrance will book movie tickets, cabs, assist with flight reservations and more, while you shop. And like big department stores, each floor at The Collective encompasses a different section. The ground floor is for gifts and accessories, including watches from cult brand Toywatch, fragrances from Italian lifestyle brand Culti and home decor pieces from Christofle. 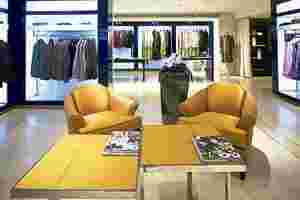 The top floor is for made-to-measure services, offering at least 1,000 fabrics, cuts and styles from Henry Poole, Richard James, Rafaela Caruso and Aquascutum. The store promises to deliver a bespoke suit in six weeks. “The made-to-measure service is handled by a team headed by a master tailor/cutter from Savile Row, London who will take close to 40 measurements and figurations," says Santacroce. Wisely, The Collective also has an exhaustive wedding wardrobe planning service that includes clothes by Tarun Tahilaini, Rohit Bal and J.J. Valaya, as well as sherwanis and turbans. All the clothing bought at The Collective comes with a lifetime free dry-cleaning service. Customers can ask for their clothing to be picked up and dropped off from their office or home. And if you find yourself in bit of a time crunch, store salesmen will be happy to bring the outfit you have in mind, in the size specified by you to any location in Bangalore. Though no dates have been finalized, Madura has plans to expand to Delhi and Mumbai. The Collective is at 40, Vittal Mallya Road, Bangalore.